You can purchase individual tickets to our concert series but those seats will be assigned on July 1. Donors, returning members, and season pass purchases (in this order) get priority when seats are assigned – until June 30. After June 30, best seats are assigned on a first come, first served basis. All tickets are mailed in September. With such a great lineup of concerts for our 2019-2020 season, it can be hard to choose – so don’t! A concert pass lets you enjoy all our concerts at a $30 discount. But what if you can’t make it to every show? Share your tickets! 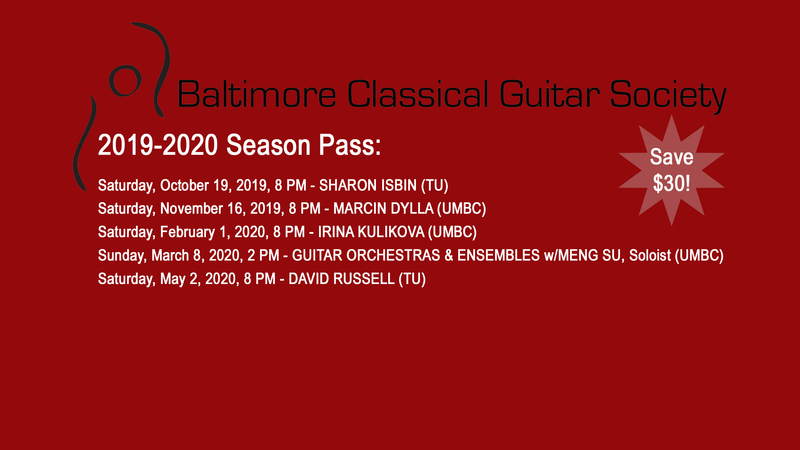 It’s a great opportunity to introduce your friends to the Baltimore Classical Guitar Society and build our community. Or donate them back to the BCGS for a tax-deductible receipt. You must renew your membership for the 2019-2020 season when purchasing the season pass at member price. Click here to RENEW YOUR MEMBERSHIP. Saturday, October 19, 2019, 8 PM, Sharon Isbin, Towson Univ. Saturday, May 2, 2020, 8 PM, David Russell, Towson Univ. 33 people are attending BCGS Season Pass <br> Save and Enjoy Priority Seating! BCGS Non-Member Concert Pass $135.00 Save by becoming a member. BCGS Member Concert Pass $105.00 Members can buy up to 4 passes at member prices.